Vortex tripods include full-sized lightweight tripods designed for strength and stability, but which won't break a budget. The Pro-GT tripod features fixed-angle, 3-section legs and a 3-way pan/tilt head. 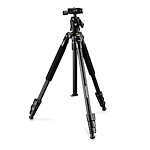 Skyline tripods offer multi-angle 3 section legs and a micro-fluid head. Vortex also has smaller tripods with ball heads designed to minimize weight for trips deep into the back country. Vortex tripods include several lines of full-sized lightweight tripods designed for strength and stability but which won't break a budget. The Pro-GT tripod features fixed-angle, 3-section legs and a 3-way pan/tilt head. Skyline tripods offer multi-angle 3 section legs and a micro-fluid head. 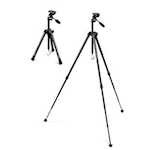 Vortex Dakota, Ridgeview and Escape tripods are anodized aluminum tripod kits that include ball heads. These tripods have 4-section lever-locking legs, rubber feet, and differ in their size, weight and payload capacity.